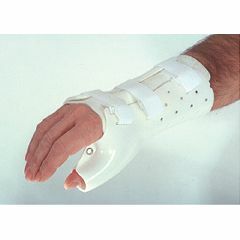 The Wrist-Hand PlastiCast immobilizes wrist while allowing full finger/thumb ROM. Wrist-Hand-Thumb PlastiCast provides rigid wrist/thumb immobilization with full ROM. Semirigid polyethylene shell with a 1/8" thermo-bonded closed-cell polyethylene foam interior for comfort and easy application. Hook and loop closures. Ventilated. Hypoallergenic. Radiolucent. Water resistant. Modify with scissors and heat gun. Two presewn, cotton stockinette liners supplied. Indications: Post-cast fracture immobilization, navicular fractures, nondisplaced distal forearm fractures. I use it all time. I broke my wrist and in cast for last 8 weeks. After the cast remove. My hand and my wrist still in paint. I bought this Brace and I wearing for the 4 days the paint is gone and my doctor toll me I should use it for a long period of time. this is good products, I wearing this brace all time. alot people asking me where do I get this brace? I love every minute of it.